G. I. Joe and the K-9 Pups made by Unique Arts are also in this rare toys collection. 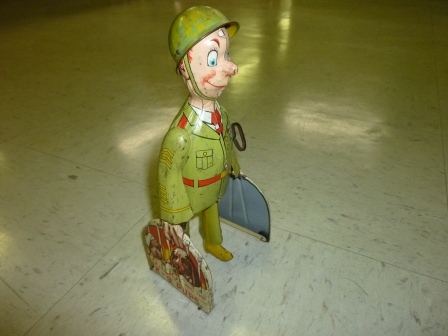 This silly tin wind-up army sergeant with some battle weary pups at his sides stands just over 9” tall with a built in key. When wound up he walks rather quickly and the dog cages are also on wheels. Any collector of rare toys or antique toy dog collectibles will love seeing this at DFW Elite Toy Museum.